My daughter was taking an art class at her school on Saturdays earlier this year. I would drop her off, go get some coffee and visit with Rod Klukas at the camera store, then go out and photograph or scout for a few hours until I had to pick Lindsay up. One Saturday I noticed this large painting in one of the art classrooms. 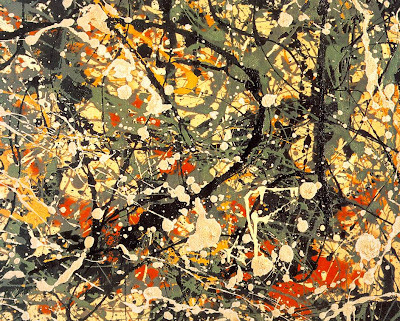 I asked Mr. Pesselato about it and he explained they were doing an homage to Jackson Pollock in the Art Club. I thought it was pretty interesting and asked if I could photograph it, to which he agreed. I spent about an hour and a half photographing it, using a Nikon 120 Macro lens on my 4x5" camera with Velvia 50 so I could get up close and personal. These are all really small snippets of this large painting. Even in this small area the complexity is incredible. I made six images that morning and this is the first one I have scanned. I will post the rest when I have them scanned. The colors are intense and the abstraction is reminiscent of Brett Weston or Aaron Siskind. Earlier in my photographic career I would have photographed this in black & white. But now, with my new appreciation and understanding of color this was the ONLY way I could photograph it today. I even tried converting it to black & white in Photoshop and it did nothing for me. Below is the original and complete painting by the Art Club of Phoenix Country Day School. It is at least 4x8 feet in dimension. 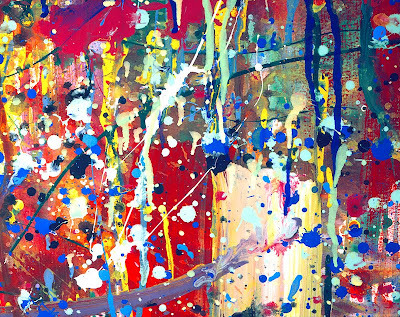 This is actually an Inspiration once removed... the Art Club was inspired by Jackson Pollock, and I was inspired by the students at PCDS. Thanks kids! Art Club Spring 2009, Jackson Pollock Exercise, acrylic on paper, 48x96"
Josef Sudek was born in Czechoslovakia in 1896, the same year as my grandfather. 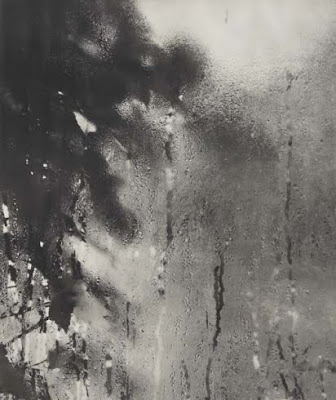 He began photographing in 1913. He was originally trained as a bookbinder and, ironically, his younger sister went into photography, but he had a become a keen amateur photographer before being called into military service in the First World War in 1915. He was wounded in the years that followed, requiring that his right arm be amputated. Despite this handicap, he continued to photograph for more than 50 years with mostly large format cameras. I don't ever want to hear another large format photographer complain about the weight of their cameras! Sudek's photographs are often dark and mysterious, bordering on mystical, yet they contain beautiful tones despite the limited tonal scale. As he had only one arm he preferred contact prints, and his images are prized for their delicate beauty. His work was often very personal with subject matter that was close at hand, such as the window from his studio, or still lifes composed of common kitchen and household objects, although he also made beautiful landscape and cityscapes of his native Czechoslovakia. He became known as the Poet of Prague. 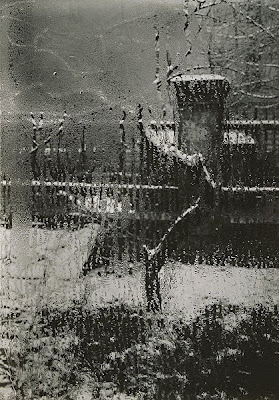 Josef Sudek died in 1976. In 1985, we had a nice snow storm in January. My parents' house, built in the late 1950s, did not have the windows we are used to today – energy efficient, double (or more) paned – just plain ol' plate window glass. 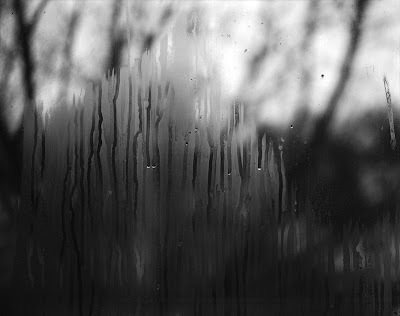 When it snowed, or was humid there was often condensation on the insides of the windows. 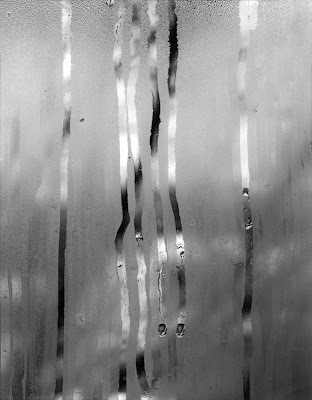 I became entranced by the mystical quality of the background imagery through the sweating glass. I made these two images with my 4x5 camera in my bedroom. I have printed them at 11x14, but much prefer the 4x5 contact prints. I remember the first time I saw this image at the Witkin Gallery in New York back in the Early 1980s. The tones and unending vertical lines mesmerized me. I wish I had the few hundred dollars it cost to buy an original (not Library of Congress) print back then, but fresh out of college equals fresh out of money! Walker Evans did a substantial amount of work in Moundville, Alabama back in 1936 for the Farm Security Administration enacted by FDR during the Great Depression. There are so many great photographs from this town it would be interesting to go back and see what it is like now. It would be even better if the current administration would fund it, but of course, they find it more important to spend unGodly amounts of money elsewhere. 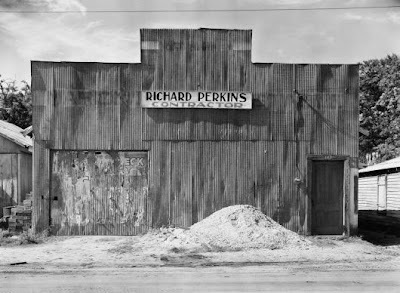 William Christenberry did just that in the 1960s through the 1980s. He grew up near the area and became fascinated and inspired by Evans' work capturing the "ordinary" scenes in rural Alabama. This work eventually became a traveling exhibit, a book, Of Time & Place, and even was interpreted by Christenberry as sculpture. If you can find the book, published by the Friends of Photography, pick one up - it's a good read. I have a copy in my library. On many of my Sunday morning photo jaunts I would pass this place on Van Buren Ave. at 20th Street in Phoenix. Unfortunately, behind chain link fence, barbed wire and dogs, this place was never open. In late May 2008 the light was perfect... the sun was in front of the building and early in the morning it raked across the corrugated aluminum facade perfectly. I desperately tried calling to see if I could get permission to photograph the building, but no one ever answered or returned my message. I marked it down in my calendar to try again in one year, May 2009. I happened to be in the area on a Saturday after I dropped my daughter off at her art class and noticed that the gate was opened. I had the cameras and I was ready. I went in where it says "Office". There was nothing but junk in there. I came out and went into one of the other businesses that share the parking lot. There was this old guy sitting at a computer, smoking a cigar and surrounded by dogs. I asked him nicely if I could photograph the building, explaining my big cameras and all. He wondered why I would want to take a photograph of that "old thing". He mentioned they had been thinking of tearing it down to make more room. Thankfully, he allowed me to photograph it. I used the 11x14" camera on this and the contact print is just beautiful with creamy light tones and the beautiful vertical shadows. I am very happy I was able to make this image before Rick's disappears into history, just as Moundville has. I haven't slept a wink since I printed this new 11x14" negative! I saw this on one of my Sunday morning photo runs a couple of months ago. I had passed it one morning but did not have the 11x14" camera with me. Went back the next weekend with a friend and photographed it. As soon as I saw it I knew it had to be taken on the 11x14. 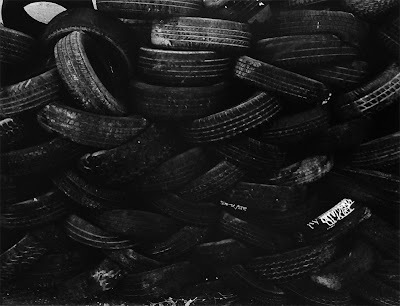 It was a wall of old tires, about 10 feet tall and maybe 150 feet long, lining an alley near Broadway and 7th Street in Phoenix. I found the lines fascinating. And the deep, dark tones highlighted by the faded rubber and occasional white paint sealed the deal. The detail in this simple image is amazing. 154 square inches of film (assuming a native film resolution of 5000 dpi) means that there's 3.85 GIGABYTES of information in an 11x14 negative. This little digicam snap of the print does not do it justice. I'm finding that size DOES count. After using my 4x5" most of the time from the early 1980s until a few years ago, I had recently standardized on 8x10". Since getting the 11x14" camera I find I want to use it most of the time, but economics dictate otherwise! 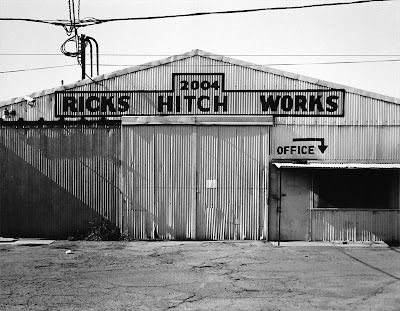 I'll have another new 11x14" contact print to post this weekend as part of another Inspirations post. 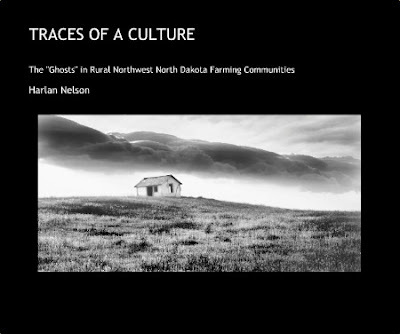 My friend Harlan Nelson has published his first book, titled, Traces of a Culture. 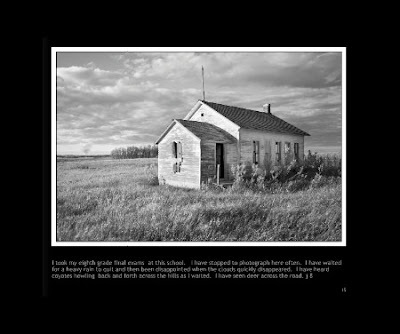 Harlan is originally from North Dakota, and after retiring in 1998 he began photographing the area in which he had grown up. The book also contains historical facts and interviews with residents and their descendants. Harlan has shown many of these photos at our Imageworks meetings, usually with "colorful" commentary about the people from this rugged area of the country. The 440 page book is available on blurb.com and is available in both softcover and hardcover. 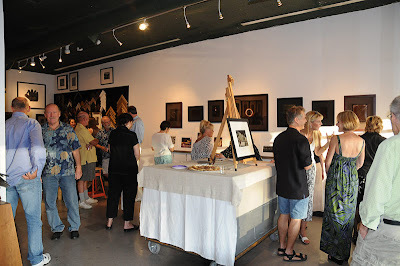 The fundraiser for InFocus, the new photography support group of the Phoenix Art Museum, held on August 1st was a big success! 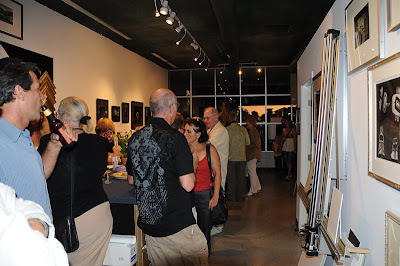 The show was well attended, and all thirteen of the photographs donated were sold during the silent auction. 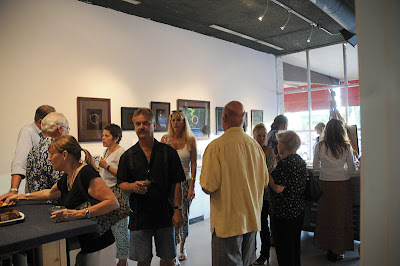 In attendance were Jim Ballinger, director of the Phoenix Art Museum, and his wife, Linda, Annie Waters, a noted Phoenix artist, and many other patrons of the Phoenix art scene. The auction brought in just under $2800 for the fledgling group. 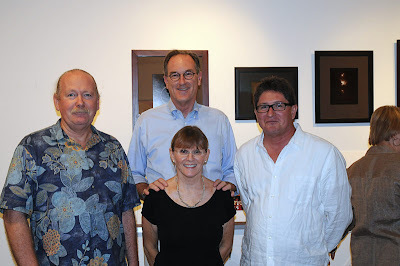 There are several upcoming InFocus events being planned, including an exhibit of photographs by Randy Efros and John Kitts. Look for more details here as they become available. 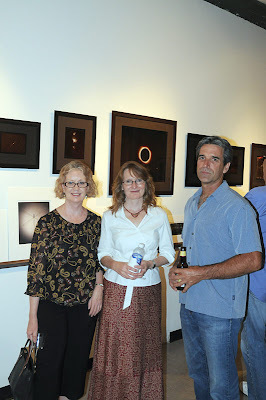 From left: Contributing photographers Judith Andersen, Joyce Bealer and John Prouty.